« Our “Need for Speed”… Hardwired? Catchin’ Up: ’14 GM pickups, Dakota Classic Rally, scorched GE, Airhead Comeback, Metrics Now! Got a chance to drive the new GMC/Chevy pickups, and they’re just as disgusting as I expected. Venue was the Big Iron Show, and after not being as much as offered a test drive by a half dozen dealers, suddenly I was Chevy’s “target market”… I must be passing well for a half dead baby boomer! They’d carved out a course to demonstrate the 4 by 4’s (limited) abilities, but honestly you could drive it without drama with any decent 2WD car and a bit of skill. The mandatory ride along even had me stop on a grade transition to show how the electronic diff lock kicked in with a wheel in the air… Gee, that’s how little suspension travel it has? Then to show off the front and rear object detection system that even vibrates your seat when you’re still a couple feet away from said object and rear camera, asked me to back up to a hay bail… I ignored the electronic nannies and backed up to but a couple inches away usin’ nothin; but the side mirrors, of course! Other 20 year old tried and failed tech was proudly displayed too- Lane departure sensor, downhill speed control, uphill rollback stop… What happened to downshifting on downhills and using the brake to stop rollback on uphill?. All told, a vehicle I wouldn’t take as a gift, but no doubt GM will sell millions. 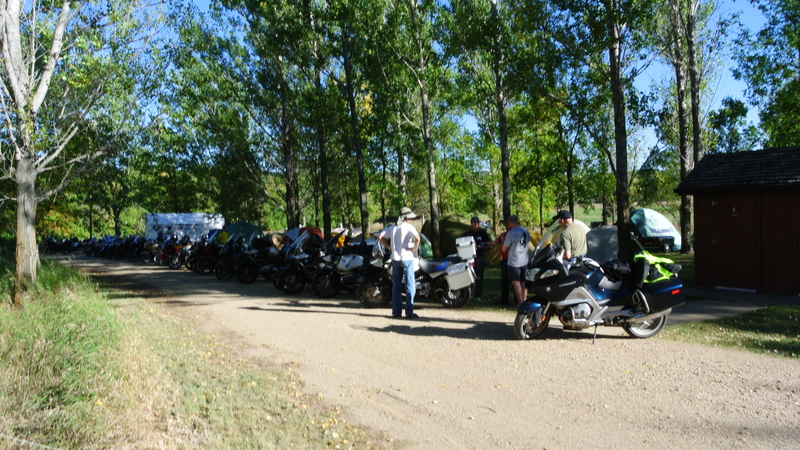 On to the Dakota Classic Rally… What more could a gearhead body want… A lovely state park in a scenic river valley, great food all weekend (morning and nite), quiet camping with showers for those who insist, lovely fall weather… Except for saturday! Plan was for a 60 mile group ride up the valley to ,well, Valley City for a buffet lunch at a local pizza place of excellent reputation. That was just the 1st leg of the 100 mile or so poker run. 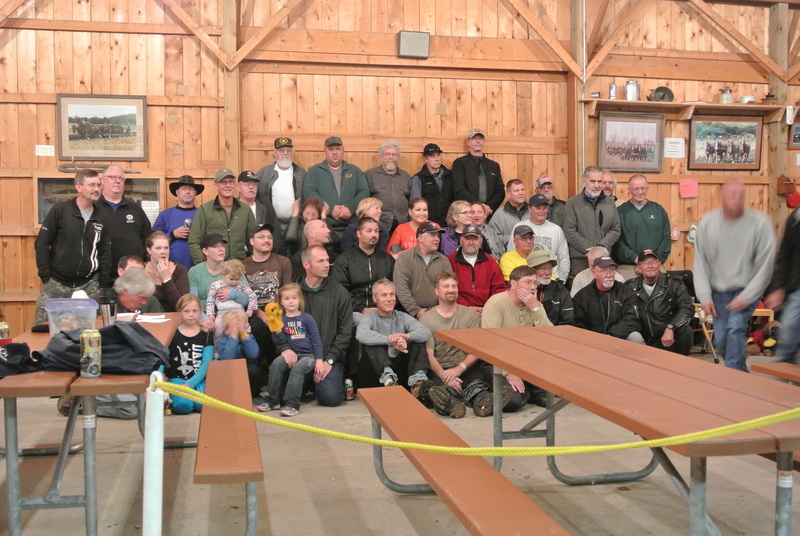 Rain started about T-minus 2 hours and counting and the deluge lasted all day, so but a brave 15 or so of the assembled 60 plus riders made the trip, and the poker run was passed on. Showing true class, the ever classy organizers brought back what must have been a dozen pizzas for us wimps who cowered back in camp! It gets better… “Round mid-afternoon gloom, one of the Park Rangers stops buy and mentions that they’ve got a barn sized hall just up the road, complete with commercial kitchen. And would we like to use it for dinner, no extra charge? To top it off, so nobody had to ride in the rain, the Ranger used his minivan as a shuttle bus to haul us up there! So here we be, warm, comfy, and very well fed, while the world washed away outside! Memo to the organizers: Rent this lovely building next year, I’ll be happy to pay an extra $5 on top of the bargain $30 rally fee to cover the costs! Shortly afterward the heavens closed up, a warm campfire was lit, and we had great weather for the ride home! 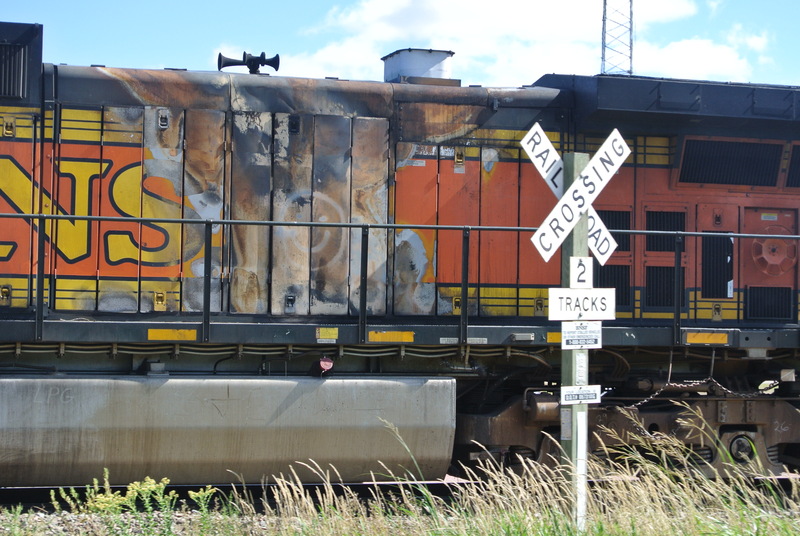 Just a little reminder that GE may have caught and passed EMD in sales, but not necessarily in quality… Scorch marks,probably from another GE stack fire. Locomotives and loaded unit train had to stop for track work on a slight upgrade, and when they were given a “highball” to get on the move again, the engineer accelerated very gingerly, sounded like run 4 at most. Given that the trio of engines were the older DC models that don’t take well to full throttle at 0 MPH and the aforementioned scorch marks, the light throttle application by the engineer was judicious. Meanwhile, the “race to the bottom” in the locomotive biz continues, with GE opening a non union plant in Texas to compete with EMD’s in Indiana. Rising to the challenge, EMD has introduced a new passenger locomotive with what looks to be an MTU motor painted CAT yellow. Not surprising, given that reportedly CAT is selling a new piece of pricey construction equipment built by archrival Komatsu. Will the new 2015 emissions compliant EMD loco be a repainted GE? Been ridin’ the ’84 R65LS a fair bit lately, including the 600 mile or so round trip to the Big Iron Show and Dakota Classic Rally. The F800S’ failed alternator and breakdown was a wake up call- the airheads may be decades older, but there’s serious parts and knowledge base support readily available. Push a button and lift the seat and you’ve got access to the battery, undo two hoses and a clip and the tank is off, two allens and you’ve got access to the whole electrical system. Tools? Well chosen selection fits in the tool roll right under the seat. Spares? Space under the tail section. Wanna get seriously tooled up and have your own parts department? Those tank panniers are perfect, and they won’t even fit the F800S. 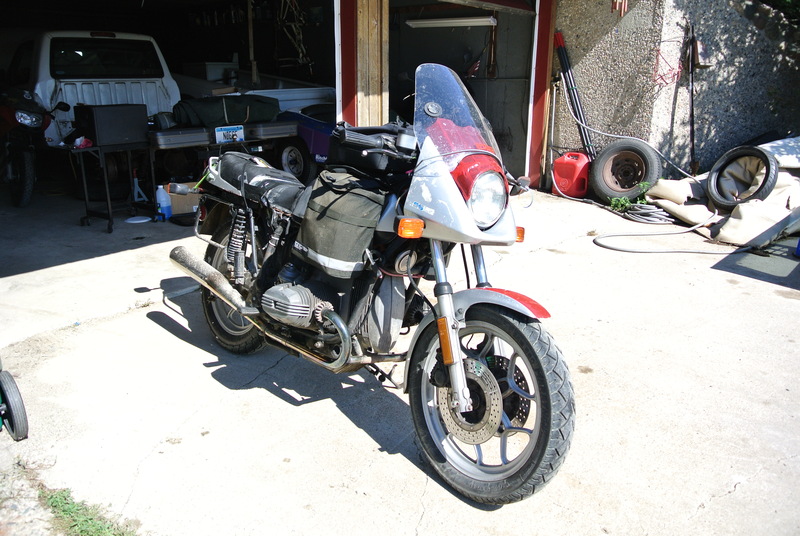 Leaving the tank bag which is twice the size of anything that will fit the aftermarket luggage incompatible F800S for clothes and such instead of spare belts., stators, and the tools to change them. Out back, the trapzoid shaped bag mounts will fit a variety of bags that BMW made the standard for decades, instead of the anemic 28 liter glorified soft bags BMW offers for a mere thousand or so. So for real world riding, a three decade old BMW airhead matches BMW’s latest and “greatest”… BMW engineers, whatcha been doin’ all these years? I’m getting torqued enough to start a movement. Put new rear linings and hardware on the ’98 Ranger, and the new drums are such a poor fit they’d have to be hammered on. About what you expect given that Ford was still building that 1960 Falcon rear axle with tired tooling in inch dimensions in 1997, then semi-skilled chinese factory laborers that have only known the metric system try to make parts for it. Heck, even the young parts counter guy at NAPA is confused and gives me metric lines instead of inch. You’d never know it, but the metric system has been the official system of measurement in America since the 1980s, by federal law. But all that factoid might due is win an argument at the truck scales when you’re a tad over or convince the housing inspector that to let your slightly oversized garden shed slide, on the grounds that a 100 square foot or less shed rounds out to something slightly bigger when converted to it’s 2 digit metric equivalent, as dictated by federal law. So why, decades and even centuries after the rest of the world went metric, are we still doin’ it the hard way and crippling ourselves? Meanwhile, the teabaggers over at bigmacktrucks.com are going all lock’d and loaded over creaping metrification and electronic controls. Me, I look forward to the day when I can scrap my last “english” wrenches! BTW, our American gearhead isolationism extends to conventional cabsbig trucks, with only a handful of makers left… Europe and Japan went cabover decades ago, with the developing world following suit. Doesn’t bode well for the Mack brand, with no cabovers but a couple boxy fugitives from the 70s in the lineup.